Have you been jealous of your friends with their iPads? Of course not! However, when you see your buddy with his Xoom and your girlfriend with her Tab 10.1, your heart sinks as you turn green with envy. Well no more, if you are looking for a tablet with ports up the wazoo then look no further. 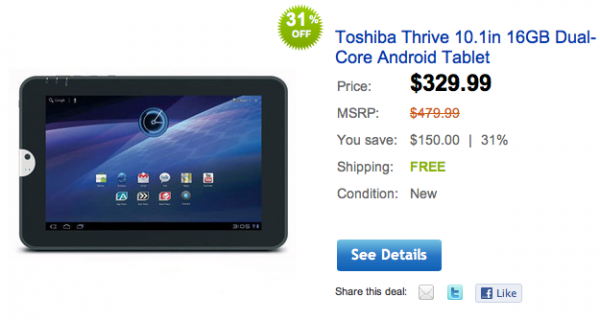 For today only, the 16GB Toshiba Thrive is available through Buy.com’s Ebay page for $329.99 with free shipping, but as with any daily deal – supplies are limited as is the time. The Thrive has full HDMI and USB support, a full SD card slot, and a replaceable battery – all of these things can justify the bulkiness of the device. The tablet ships with Android 3.1 Honeycomb and has the usual dual-core processor and 1GB of RAM. Additionally, Toshiba has added a built-in file management system to help you access those files that you can never seem to locate. To take advantage of this deal be sure to visit the source link. Tuesday Poll: The One App You Can't Live Without?